+ FREE SHIPPING AND BONUSES! 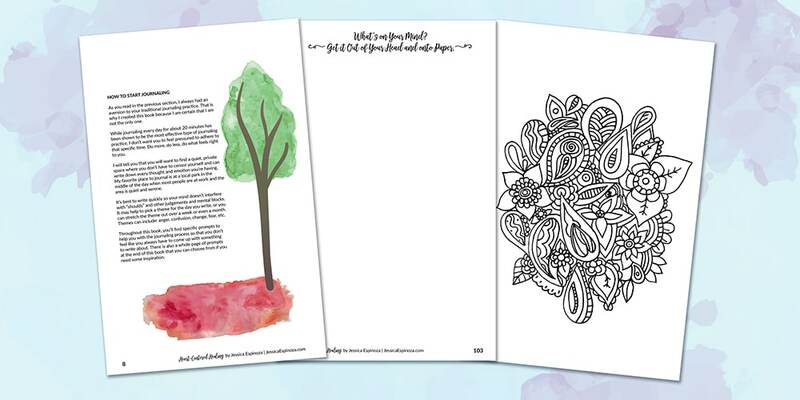 Scroll down to learn more about this journal, or if you are ready to purchase now, just click on the Order Now button below. If you’re here reading this right now, I’m guessing you’re curious about journaling. It’s something you’d like to do, but you’re not sure where to start, or if you’d like it. You may not even know why you should even attempt journaling (hint: there are some pretty awesome health benefits!). But you know that journaling is something that has captured your attention. 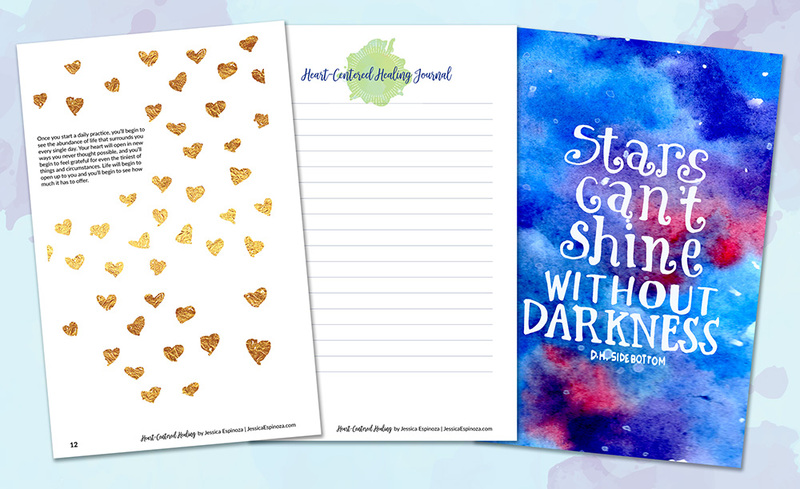 Have you wanted to create a journaling routine, but just can’t get started (or stick with it)? Does a book filled with blank pages feel overwhelming and uninspiring? Are you afraid that you have nothing “good” to write about? Do you buy notebook after notebook thinking that *this* will be “the one”? 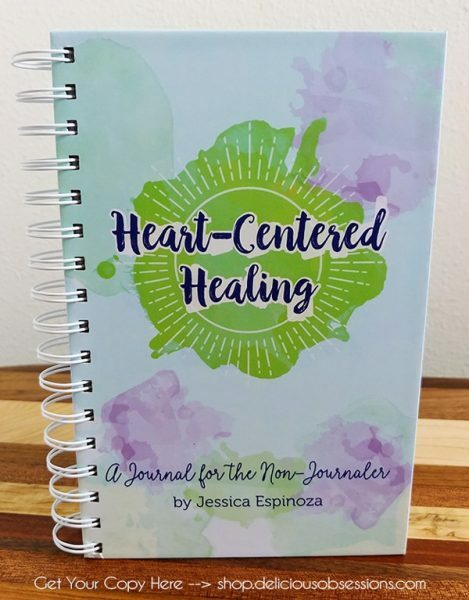 If you answered yes to any of these questions, then Heart-Centered Healing: A Journal for the Non-Journaler may be the perfect solution for you! This book developed out of my own love-hate relationship with journaling. For almost my entire life, I have wanted to cultivate a regular journaling routine, but I have never been able to stick with it. I’ve purchased countless journals and notebooks, from fancy to plain, all in the hopes that that next book would be the key to shifting my relationship to journaling. And yet, journaling eluded me. I’d write a few thoughts down for a day or two, but then I’d get annoyed and move on. I would become overwhelmed and intimidated by a big blank notebook. I’d find myself straining to write one page of content. In comparison to some, I felt as though my life was rather simple and boring. What on earth do I have to write about? Even though I struggled with journaling, I had a strong desire to make it a regular part of my life. I felt a call to capture my life in some sort of written form (outside of blog posts). 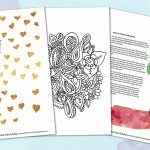 I knew I had to find a way to make journaling comfortable and fun for myself…something that I could stick with for the rest of my life. One day, I took a blank sketchbook (leftover from art school many moons ago) and just started carrying it with me wherever I went. I would jot down random thoughts, to-do lists, things I wanted to learn or explore, business ideas, or just an a-ha moment that I might have while I was out and about. I didn’t write page after page of words. I didn’t sit down at a specific time each day to write. Some days I didn’t write anything, I simply sketched or doodled, or wrote down inspiring quotes that I had heard recently. I gave myself specific personal development questions to answer or other fun activities that I had come across. I used colored pens and pencils because color just makes me happier. Little did I know that this new method of capturing my thoughts, experiences, and dreams helped me sink into a more regular journaling routine. 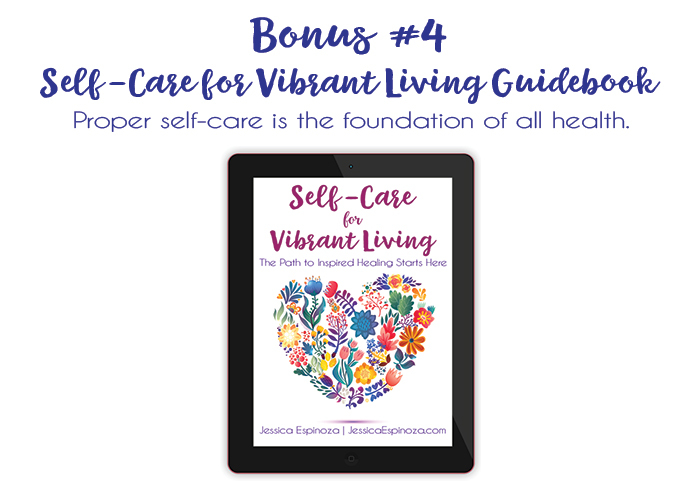 One that allowed me to relax into the process of self-exploration without getting caught up in the fear of pain or perfectionistic tendencies that had long plagued my life. Gone was the overwhelm of looking at a book full of blank pages. Instead, it was replaced by fun activities that helped get me out of my head and allowed me to grow, even if I wasn’t writing page after page about my life every day. One day, I realized that if I had struggled with traditional journalling, then I certainly couldn’t be the only one. 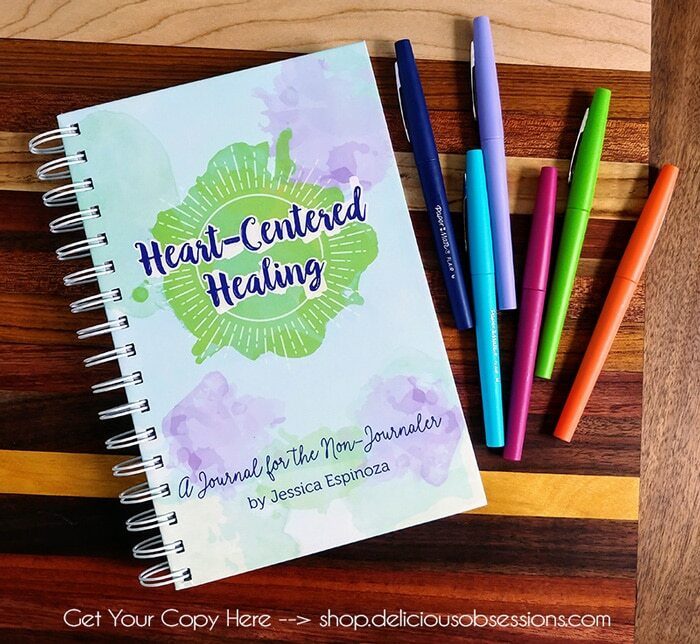 Many holistic practitioners recommend journaling to their clients and patients as a way to help with the emotional and mental parts of healing. 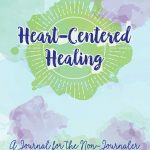 How many people could really benefit from a journaling practice, but felt overwhelmed by it, just like I had? 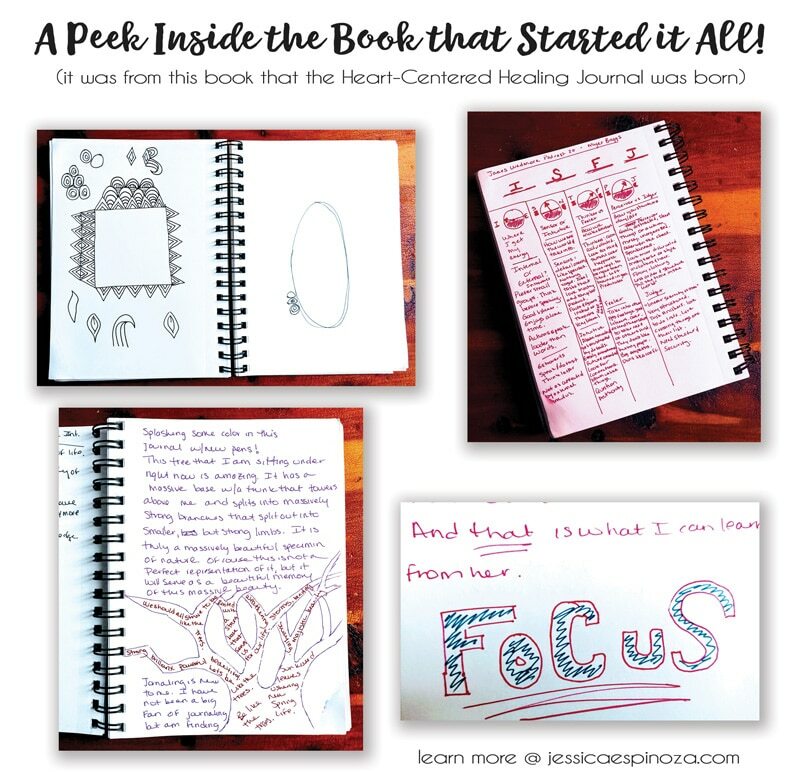 It was in that moment Heart-Centered Healing: A Journal for the Non-Journaler was born. They say necessity is the mother of invention. Out of my own necessity, I created a journal that finally makes me want to journal regularly. This became a passion project for me, filled with my heart and soul. And now I would love to share it with you. 260 pages with a beautiful hardcover and metal spiral binding. a fun, colorful, whimsical design that will relax and inspire you. 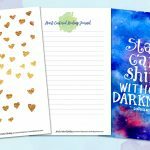 information about why journaling, gratitude, and meditation are so important to our physical and mental health. 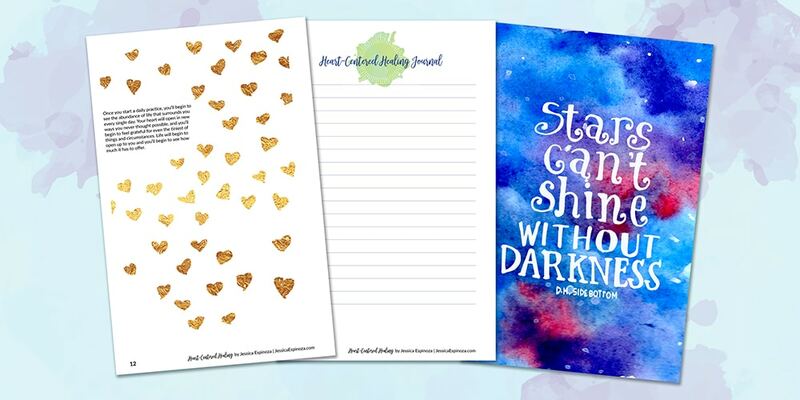 lots of places to write down your thoughts, dreams, hopes, and desires, from lined journal pages to blank sketching or doodling pages. 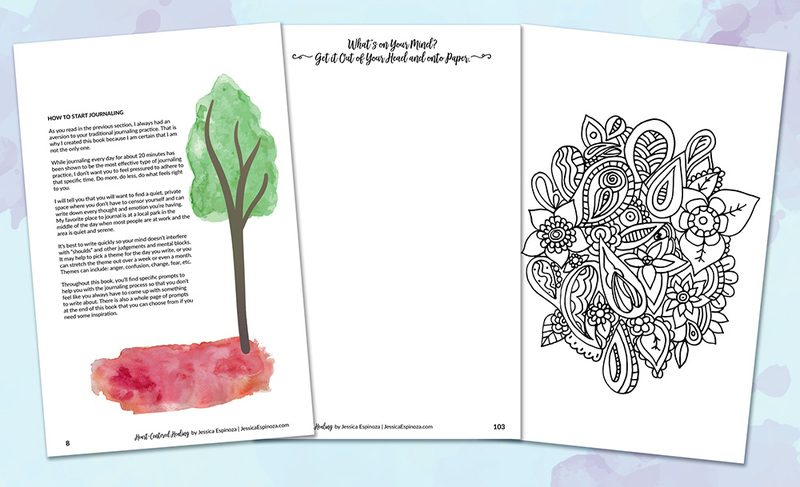 thought-provoking activities and journaling prompt that encourage you to dig a little deeper. motivational quotes that will keep you inspired, optimistic, and hopeful about life and your future. 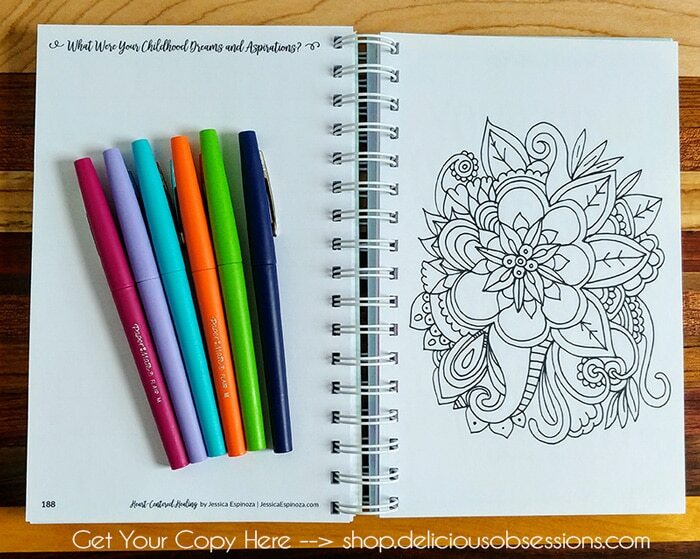 and for those days where you don’t feel like writing anything (but still want a little quiet time to yourself), coloring pages that will offer a small retreat from your daily life. What is most important to know is that there is no right or wrong way to use this journal. There are no expectations, no rules, no formal structure. 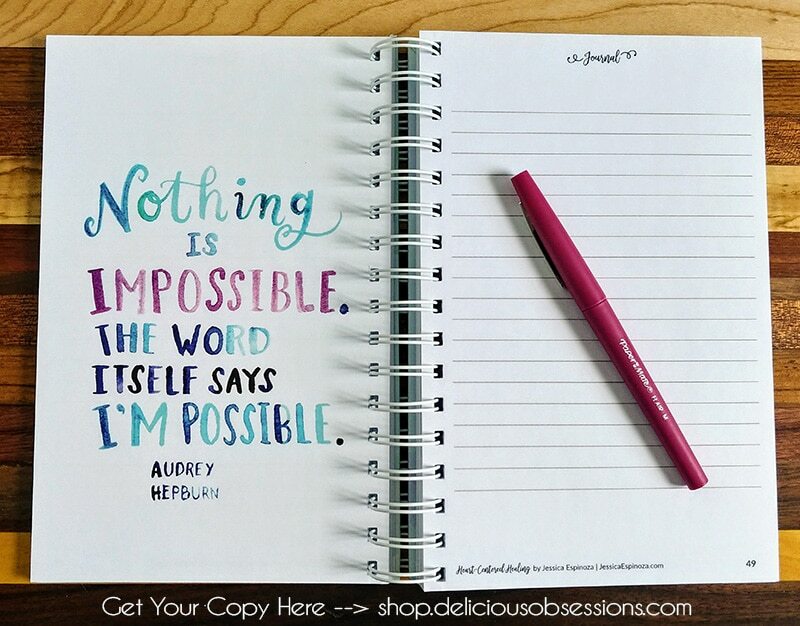 This journal was created for you, my non-journaling friend. It is a way to capture snapshots of your life and learn more about yourself through the power of writing and reflection. I want nothing else than for you to HAVE FUN with this book. 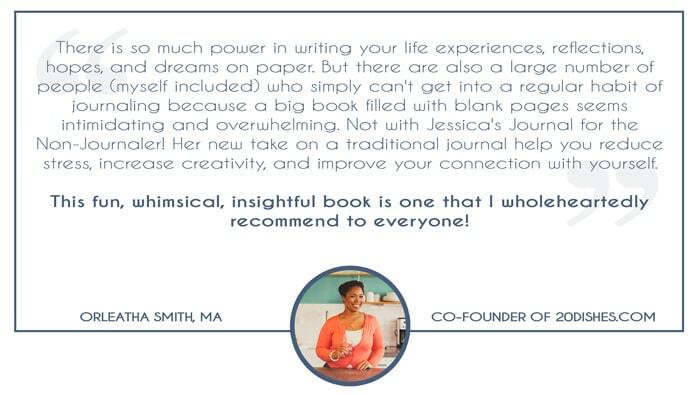 I want the process of journaling and deep exploration of your life to be a fun and uplifting experience. I am so incredibly proud of how this book turned out. The fun, whimsical, airy design makes it exciting to pick up and inspirational to write my thoughts in. 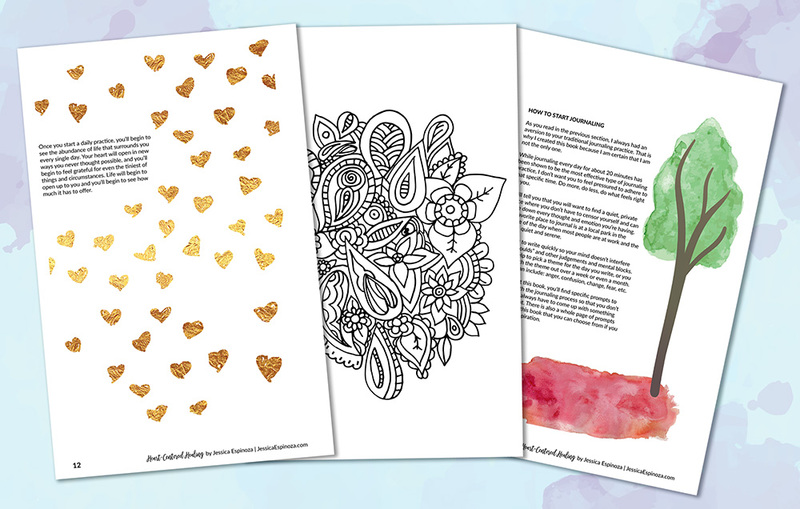 Take a peek at some of the inside pages (scroll to the bottom of this page to see even more interior pages!)! Are You Ready to Cultivate a Journaling Routine Once and For All? 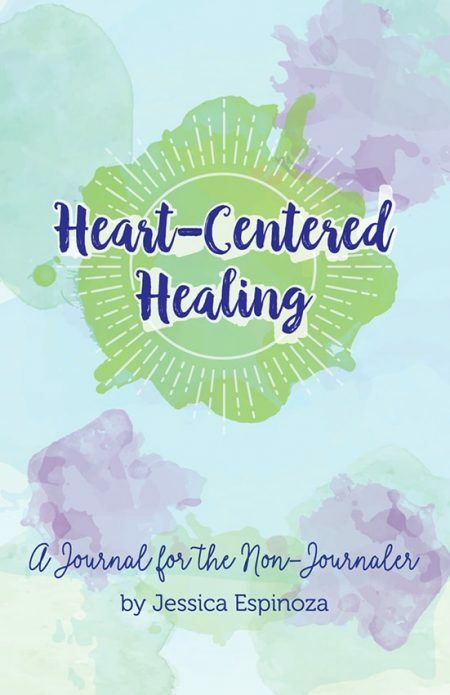 If so, Heart-Centered Healing: A Journal for the Non-Journaler is here to help you achieve that goal. 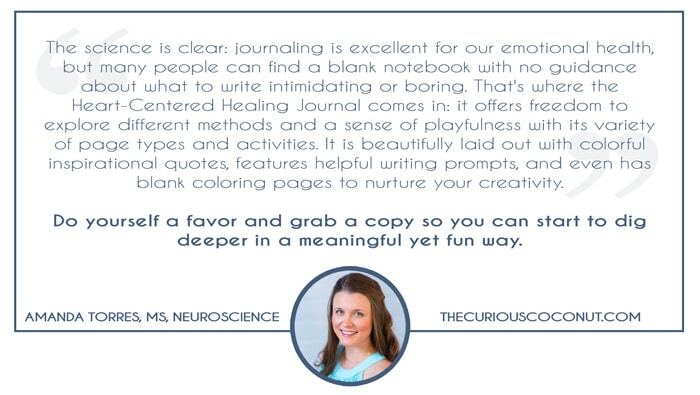 Now you can finally experience the benefits of journaling and mindfulness without the stress and overwhelm of a big blank notebook. 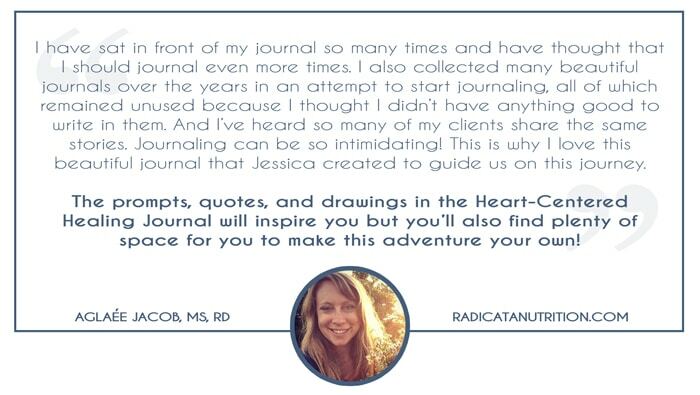 Once I learned how I best liked to journal, I found it to be an indispensable part of my own healing journey. Gone was the frustration I had felt in the past. Instead, I now looked forward to my journaling sessions, especially if I had the time to go somewhere outdoors to write. 5 Awesome Bonuses With Order! 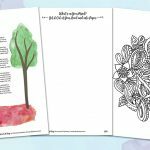 A PDF “preview” version of the journal that you can print off and start using right now. 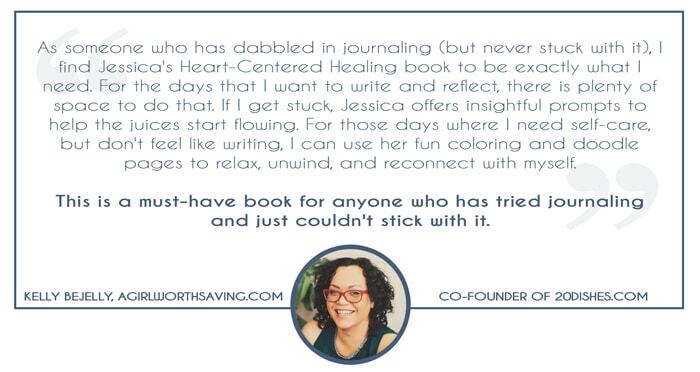 I can’t wait for you to get your copy of Heart-Centered Healing! I know it will be the perfect companion to your healing journey. I never thought I would get to a point where I really enjoyed journaling or kept my journal with me regularly. But now, thanks to my “new” method, I embrace journaling and it has embraced me back! Is this an eBook or a print book? I pre-ordered the journal. Now what? First of all, THANK YOU for your order! Your support means a lot to me, especially since this is such a deeply personal product I am releasing. 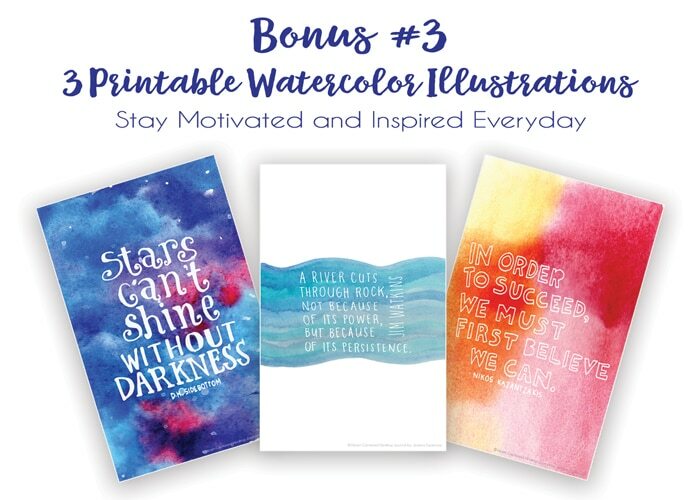 While you are waiting for your journal to arrive, you can download all of your bonus items (information is emailed to you after you place your order) and start enjoying those right away! Download links and detailed info are in your order confirmation email you received after placing your order. I ship all orders within the United States via United States Postal Service (USPS) using their 2-3 Day Priority Flat Rate Shipping. The journal will be sent in a padded envelope to ensure safe delivery. Absolutely, but you will need to contact me directly with your address so I can pull a custom shipping quote for you. Right now our estimated time of arrival from our printer is early March. If all goes well (fingers crossed! ), we should have your book in the mail by mid-March, 2018. If this date changes, you will be notified via email with an update. I would like to buy in bulk/wholesale for my clinic, brick and mortar store, church group, and/or local community. How do I do that? Thank you so much for considering my product for your business! I do have bulk/wholesale options available. Please contact me here with your inquiry and we will discuss all the details. Help! I haven’t received my download links for the bonuses! Oh no! I am so sorry about that. The download links are all in the email you received right after purchase. Have you checked your spam folder or the Promotions tab (if using Gmail)? If you can’t find the email in those two spots, please contact me here and I will get you all take care of! How do I listen to the meditations? 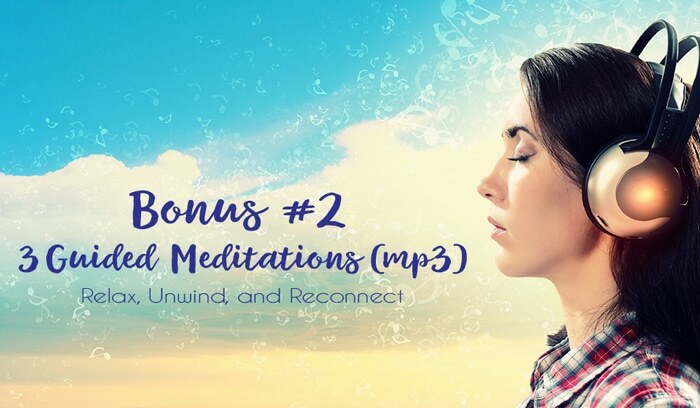 The guided meditations are provided in MP3 format. You can download them to your computer, laptop, tablet, or other mobile device and then play using whichever media player your device uses.